Opposition parties with representation in parliament look set to resume the fight for the new constitution in parliament as the house resumes sitting next month. The United Party for National Development (UPND) and the Movement for Multiparty Democracy (MMD) have indicated that the fight for the constitution through protests in parliament, which disrupted parliamentary proceedings before the house adjourned will resume. UPND spokesperson, Charles Kakoma, has told QFM news in an interview that UPND President Hakainde Hichilema has directed his members of parliament to ensure that they push for the release of the final draft constitution once parliament resumes its sitting. Mr. Kakoma says the fight during the last session of the national assembly was a tip of an ice berg compared to what is coming in the next session. He says UPND members of parliament have been urged to be aggressive in their quest to push for the release of the final draft constitution. 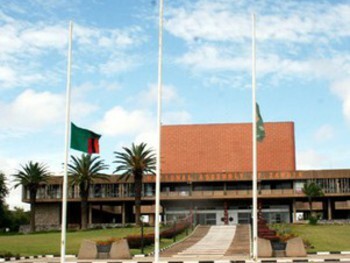 Mr. Kakoma says the Zambian people should expect more from the UPND MP’s as parliament resumes sitting. And MMD president Dr. Nevers Mumba has told QFM news in a separate phone interview that as parliament resumes its sitting; the grand coalition will call for a caucus meeting with MMD and UPND mps to strategize on how best they can push the agenda in the house. Dr. Mumba says the fight is getting hotter each day considering that more people and stakeholders are coming on board to push government to release the final draft constitution. The third session of the eleventh national assembly will resume sitting on Tuesday 17th June, 2014, having adjourned on 11th march.